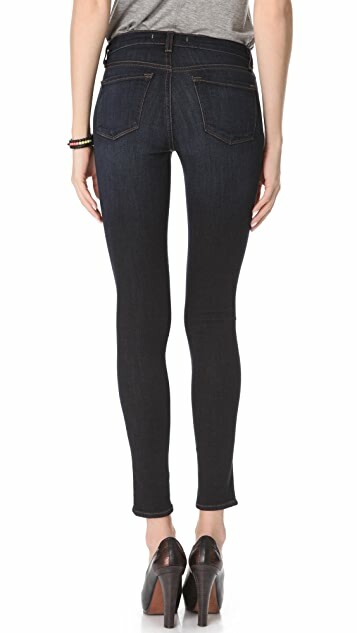 These skinny jeans feature 4-pocket styling and a single-button closure. Mild distressing. 10" leg opening. * 65% cotton/33% tencel/2% elastane. I have given up on all jeans and stay true to J Brand without fail every single time. The colour is perfect... my only fault would be the sizing (if you can call it a fault - just makes online shopping hard). I am normally a 25 for stretch denim and 26 for firm denim and was expecting these to have more give with the tencel portion in the fabric but unfortunately am needing a 26 to make them more comfortable. The 25 fits but a bit too firm for everyday comfort. J brand is always my go to brand for denim. I am 5'6 135lbs with a small waist and larger hips and these always fit perfectly. They stretch just the right amount and the wash is excellent for day or night. Great classic! 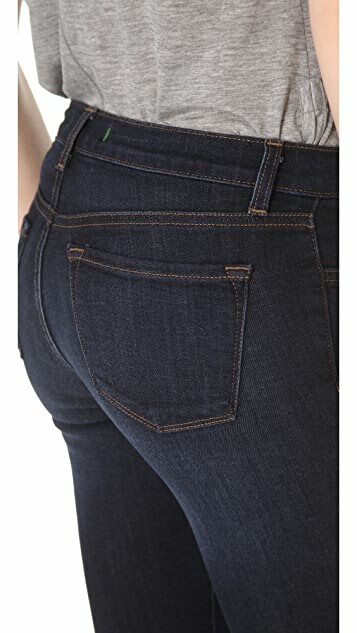 I love these jeans, they fit perfectly, the dark denim is slimming, and the fabric is soft. I normally wear a 27 and that is the size I ordered. One of my favorite pairs of jeans! My first J Brand jeans, so I wasn't certain about which size to order. I am 5'6", currently hovering around 110lbs and usually wear a size 0-2 (depending upon the designer). I ordered a 27 and although I need to wear a belt to keep them in place, I am perfectly happy with the fit even with the stretch...a little breathing room around my mini-ponch caused by a lazy winter. But if you want them "skinny" from top to bottom and your size is similar to mine, a 26 might be the way to go. 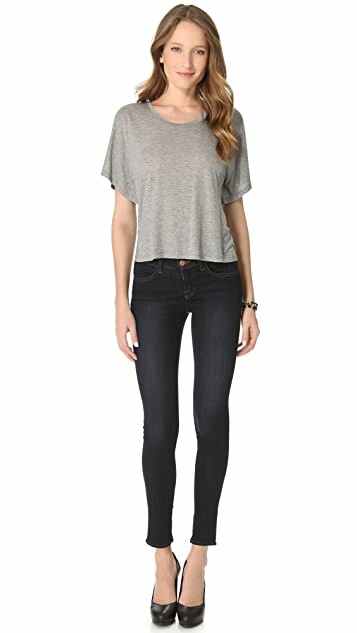 I needed some new jeans so I sorted by all shopbop's top rated styles. I wanted a mid rise, that would be full length on my modest frame & these fit the bill. Upon first inspection they seemed perfect, but my the end of day one they were completely stretched out. After the first wash I thought I would give them one more shot, but after just a couple of hours they bagged around the knee and were shapeless around my body. Maybe it's the tencel in the fabric? These are the first J Brands that I am not happy with : ( Unfortunately I wore them before discovering their flaw so I'm stuck with 'em. 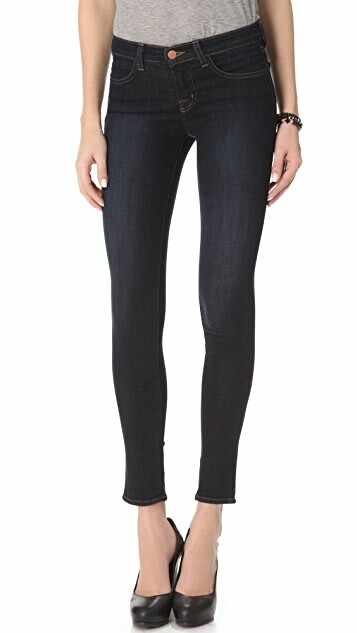 J Brand is my go-to brand for a great pair of jeans. I'm a curvy chick and I think they're always flattering its like they hug your body and say 'we're in this together, lets rock out!' and these are no different. They're technically 'leggings' but they're not thin they really give the denim vibe. You can never go wrong with a great pair of regular blue jeans that are versatile. I could not be happier with this pair of denim. The fit is impeccable! I am 5'2 in height, athletic built, small waist and built quads and these legging jeans slim me down beautifully. The tapering on the end of the leg is fantastic. I would recommend these pair of legging jeans to everyone. A sure buy! Lovely soft super stretch fabric. If you are between sizes go for the smaller size as the stretch in these is fabulous. Weigh 49 kgs, waist measurement 24,4 inches, and hips 34,25inches, took a size 25. They are a tad long, but then I'm very short. Thanks again Shopbop received these in 4 days in SA. I LOVE these leggings/jeans. So comfortable, so flattering, so gorgeous! Wish they came in other colours! I'd buy them all.